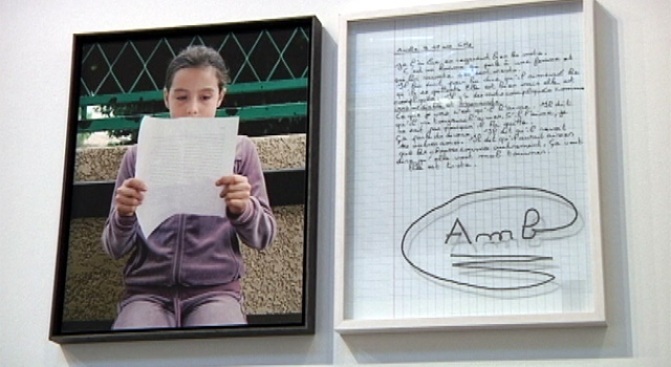 One of many pieces included in French artist Sophie Calle's new show that opened Thursday at the Paula Cooper Gallery. We've all heard the line that "breaking up is hard to do." And world-renowned French artist Sophie Calle is no exception. She was 86ed by her man via e-mail. The last line of the digital dump read, "Take care of yourself." Ever the opportunist, she turned lemons into lemonade by creating a multi-media art exhibit using that line as the title. Calle asked 107 women to look at the e-mail, analyze and interpret it. She then photographed each woman with letter in hand and produced a fascinating show. Calle's exhibit opened Thursday and will be at the Paula Cooper Gallery on W. 21st Street through the end of May. It's the first time this exhibit has opened in the United States.